A £4m trial of three zero-emissions buses on routes in central London has been a success, transport bosses say. 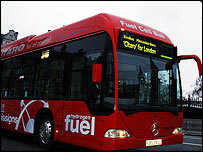 The fuel cell vehicles have run on route 25 between Oxford Circus and Ilford and RV1, Covent Garden to Tower Gateway, during the past year. A London Buses spokesman said they had "excelled in reliability" and been "very popular with passengers". London is one of nine European cities participating in the two-year trial as part of a scheme to reduce pollution. It is hoped the trial will find out whether the expensive fuel cell technology can become more efficient. London Buses Director of Operations, Mike Weston, said passengers had "appreciated the amazing environmental benefits of fuel cell technology and the quiet, smooth ride the buses offer". He said that the trials were a "positive indication that hydrogen fuel cells could offer an alternative to diesel in the future". However he admitted the high cost of the buses was a stumbling block and a mass roll-out is thought to be at least a decade away.